Fern & Sparrow: Hay is for Horses! We had a busy, fun weekend! I lounged in the garden Saturday morning while the kids rode their bikes around checking out the annual town yard sales. Later on, mom and I loaded the kids into the van and went to check out a few sales too. Mom spoiled us all and we came home with some cool finds. 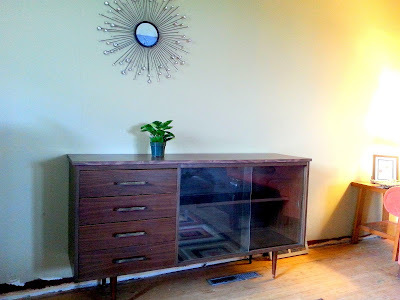 I snapped up a (mid century modern-ish?) sideboard (for only $10!!) which looks perfect in my living room. I snagged these two gorgeous tinted blue Crown glass canning jars (for only a dollar!!) and promptly filled them with fresh lilacs. Saturday evening started out with a wiener & marshmallow roast, followed by a sleepover in the tent. The kids piled their sleeping bags, comforters and pillows onto a giant air mattress and settled in for the night. They looked so cozy! They could lay in bed and look up at the stars through the screened roof of the tent. Chloe and Catie lasted in there the whole night, but Seamus came in shortly after bedtime. I think the girls were keeping him awake with all of their giggling, plus he's been feeling a little under the weather with a cold. Here's Catie getting her gear ready for the sleepover. She's got her favourite blanket and a fancy flashlight strapped to her head. Sunday afternoon, we headed to the farm to visit the newborn kittens and the horses. Seamus bonded with this little orange kitten and asked if we could take him home. I reminded him about the three cats we already had! I've never been this close to a horse before. We were right in the field with them. As soon as we stepped past the fence, they all came towards us to check us out. I was a bit nervous at first, but soon was so mesmerized by them that I completely relaxed. The horses must have seemed HUGE to Seamus, but he was pretty calm about the whole thing. I found myself surrounded by curious horses. One sniffed in my ear and drooled on my neck while I snapped pictures and giggled. I loved gazing into the eyes of this horse. Such kindness, gentleness and wisdom in those dark, shiny pools.